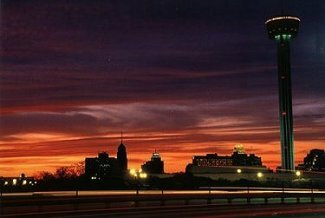 San Antonio, Texas. The cultural and commercial center for the Río Grande Valley, is famous for its Spanish heritage and its unique mix of Mexican, Anglo, and German cultures. 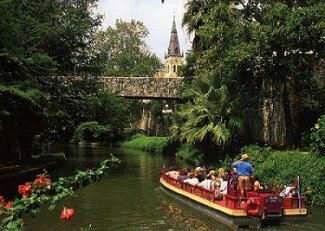 San Antonio has a tropical climate, with very hot summers and mild winters. Precipitation is plentiful, with about 31 inches falling annually, much of it in summer. The city is located in an area of rolling hills on the San Antonio River and San Pedro Creek, which comes from springs in the city. The streams bubble forth from the Edwards Aquifer, San Antonio's only source of water, which collects rainwater from the Texas Hill Country to the northwest and channels it underground through porous limestone. Two of the nation's principal interstate freeways cross in San Antonio. Interstate 10, the main route across the southern United States, connects the city with houston to the east. Products from Mexico are frequently transported on Interstate 35, which also ties the city to the Dallas- Fort Worth metropolitan region to the north. Interstate 37 links the city with Corpus Christi on the Gulf of Mexico. 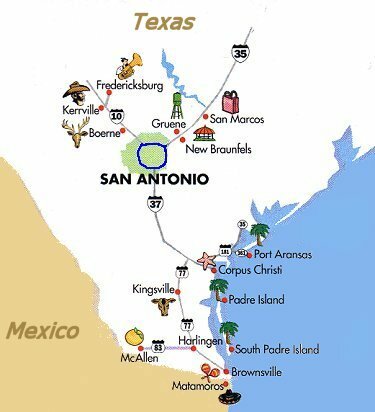 San Antonio has good railroad connections to the nation as well as passenger train service. Air transportation is through San Antonio International Aiport. San Antonio's government consists of a council composed of 11 members elected for two-year terms. Ten members are selected from districts; the 11th is chosen by voters citywide and acts as mayor. The council appoints a city manager, who administers the city under policies established by the council. 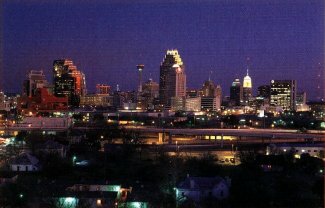 San Antonio by the mid-1990s had become the ninth largest city in the United States. Its economy historically was based on providing commercial, manufacturing, and financial services for an agricultural area extending to the south and west of the city. 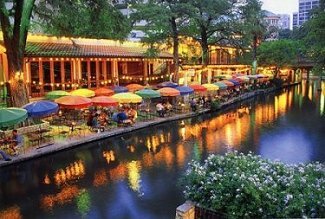 With plentiful attractions and pleasant weather when much of the nation is experiencing cold winter weather, San Antonio has also become a frequent convention host and tourist destination. Manufactures include refined petroleum, processed food, apparel, microprocessors and semiconductors, agricultural equipment, aerospace equipment, and eyewear. San Antonio has also relied economically on a strong military presence. Located near the city are Fort Sam Houston, the headquarters of the Fifth Army and home to the huge Brooke Army Medical Center; Randolph Air Force Base, headquarters of the Air Education and Training Command; Brooks Air Force Base, home to the School of Aerospace Medicine; and Lackland Air Force Base, a major training center for recruits. San Antonio still faces complicated economic problems. In 1995 a federal commission voted to close Kelly Air Force Base, site of the economically important Air Logistics Center, as part of a nationwide consolidation program. A more far-reaching problem is the fragility of the city's water supply. The Edwards Aquifer, the principal source of water for the metropolitan area, is being depleted through overuse and periodic spells in which rainfall is insufficient to recharge it. Meeting the various residential, industrial, and agricultural demands on the water source may do much to shape the future of San Antonio in terms of both population growth and manufacturing expansion in surrounding areas. The narrow upper course of the San Antonio River, spanned by many bridges, winds through the city, making a horseshoe-shaped bend around the central business district. Along its banks in midtown is the Paseo del Rio, or River Walk, a popular walkway with shops and restaurants shaded by large cypress and palm trees. Scenic excursions aboard small riverboats through the district is one of the city's premier activities for visitors.